Yesterday, I took the last stitches in the four table toppers/runners that I quilted last weekend. These projects have been on the UFO pile for years. I set out this year to quilt as many of the tops that have been sitting on the flimsy pile as I could. I had some incentive from the guild’s UFO challenge this year which I won in June. I am on a roll and don’t plan on stopping soon! This sunflower table runner is from the pattern, Easy Striped Table Runner by Karen Montgomery of The Quilt Company. Years ago, this was a free pattern on the Timeless Treasures website. 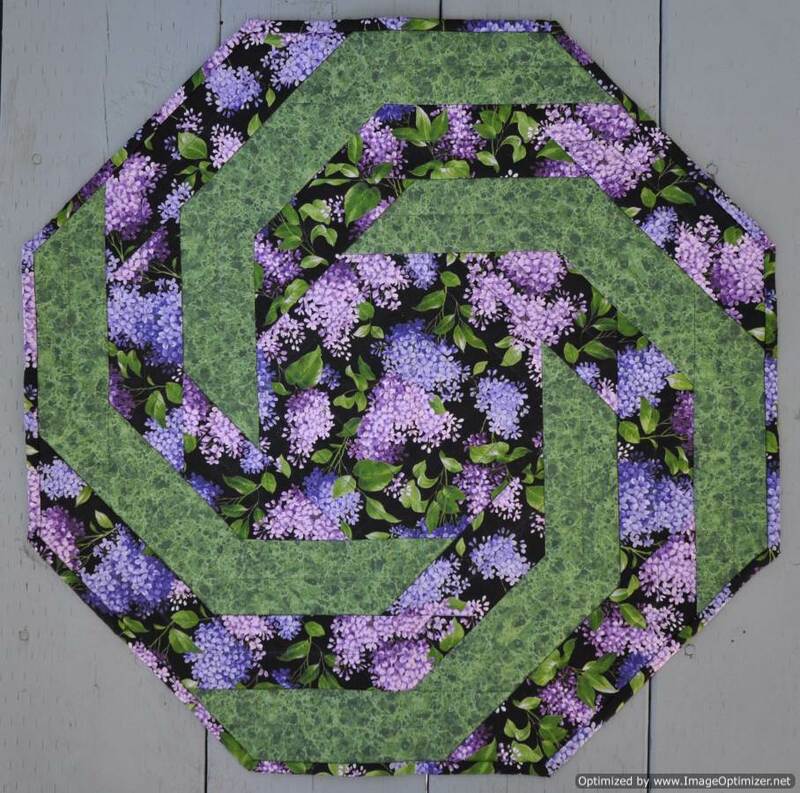 They have taken it down now, but the pattern is for sale on several on-line quilting sites. The following is taken from the pattern jacket. Although the pattern jacket says that this is the easiest project you will ever make, this project has been sitting on my “to be quilted pile” for years! I made one of these table runners for my Mom years ago and I started one for myself right after finishing my Mom’s. Like so often happens, the project that is destined as a gift gets finished and my project sits in the flimsy pile waiting for me to have some spare time to quilt it. 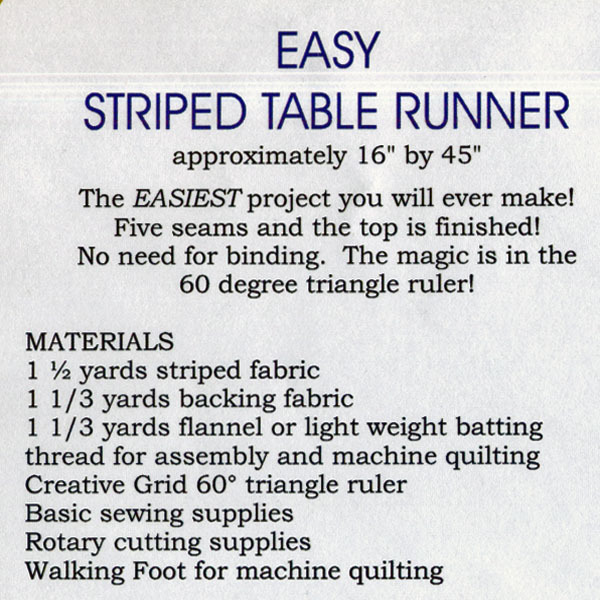 The pattern says that the runner finishes at 45″ long, but my version is only 35″ long. Once you understand how the construction works, you can vary the size of the finished runner easily. 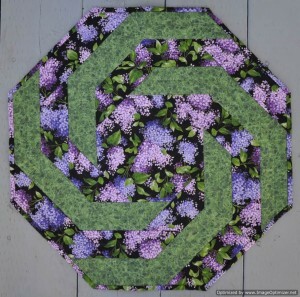 This lilac table topper is from the Spirals pattern by Ursula Riegel of Designs to Share with You. I have made this topper many times over the years. It is a great pattern to showcase a novelty fabric. While in Oregon on a trip with my Mother and Aunt in May 2008, I picked up this cute lilac print fabric. I made table toppers for my Mother and my Aunt. In 2009, I made a topper for myself. It has sat in the flimsy pile waiting to be quilted until now. 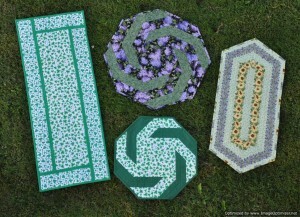 This table runner is from another of Ursula Riegel’s patterns called, It’s Fast, It’s Easy. This is another pattern that I like to go to for seasonal projects as it showcases the novelty fabrics so well. 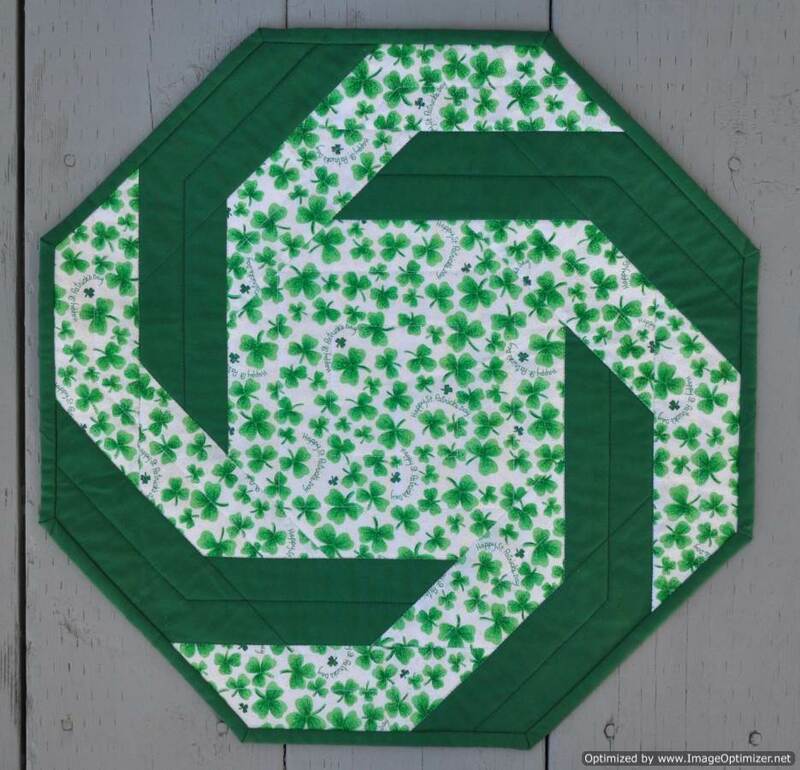 This entry was posted in st. patrick's day, table runner, table toppers, ufo finish by Norma Hanson. Bookmark the permalink. I am so happy for you—that you get to enjoy some of these items you made finished up. 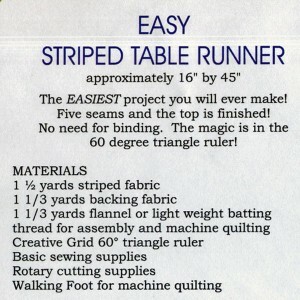 We have been chatting about some of those runners and toppers over the years and by golly, they are now usable. Go, Norma, go!